This Buttermilk Ranch Oven Fried Chicken is bound to become a new family favorite! This recipe is perfect for a quick and easy dinner any night of the week! The chicken comes out so juicy and moist on the inside and crunchy on the outside – just the way we like it! The chicken is marinated in buttermilk and ranch seasoning all day (or at least an hour!). That’s the hard part. It’s done in the morning so you can maybe get in a shower before the kids start freaking out that it’s finally Halloween! 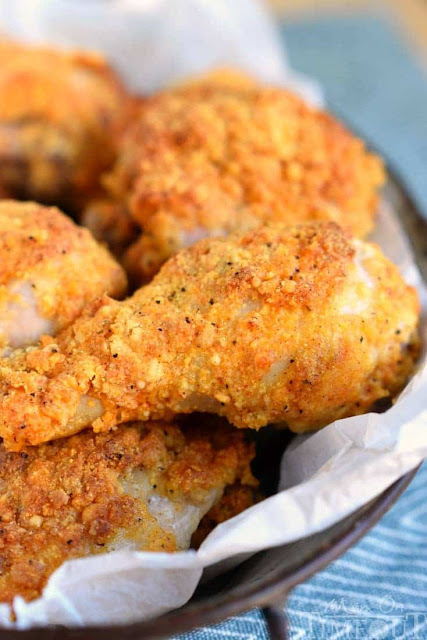 This Buttermilk Ranch Oven-Fried Chicken is bound to become a new family favorite! This recipe is perfect for a quick and easy dinner any night of the week! The chicken comes out so juicy and moist on the inside and crunchy on the outside - just the way we like it! Combine chicken, ranch seasoning, and buttermilk in a large ziploc bag. Turn the bag over several times to ensure the chicken is coated with the ranch and buttermilk and place in the refrigerator. Refrigerate for the entire day or at least one hour. Spay a large baking sheet with cooking spray and set aside. Combine corn muffin mix and seasonings in a shallow bowl. Remove the chicken pieces one at a time an shake off the excess buttermilk. Dip the chicken in the breading, turning to evenly coat. Shake off excess and place chicken, bone side down, on the prepared baking sheet. Repeat for remaining chicken pieces. Lightly spray the top of each piece of chicken with cooking spray. Bake for 35 to 40 minutes or until chicken is cooked through and juices run clear. Check the chicken at about 30 minutes and if the coating is turning too brown, just place a piece of foil lightly over the top of the chicken to prevent further browning. 0 Response to "BUTTERMILK RANCH OVEN FRIED CHICKEN"